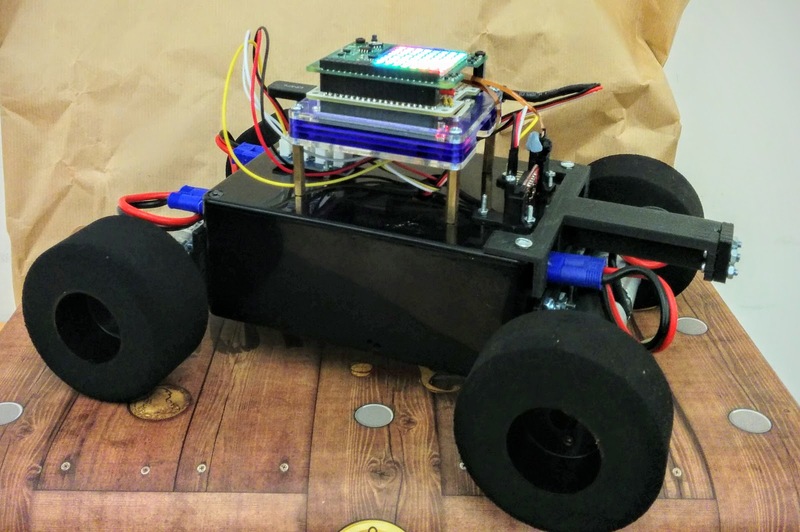 PiWars, the Raspberry Pi based robotics competition, is back for a third time and I will be, once again, competing. Last time I entered my robot 'OptimusPi' (Which I blogged about here) with my best result being runner up in the Pi Noon battle. PiWars 2017 has grown in size and is being held over two days, instead of one, and I will be competing on Sunday 2nd April 2017 in the Pros/Veteran category as team 'Pi Squared'. Whilst I'm certainly a veteran of PiWars, I'm not sure I count as a Pro! So what is my plan this time? Well for OptimusPi I started on the basic chassis quite early, having a basic bot driving around before working on anything else, but in the end I found myself feeling quite constrained with the design, especially when getting all the sensors and other components to fit inside. So this time around I'll be starting with determining how I'll be approaching the various challenges, trying it out on one of my existing robots, and coming up with a chassis design later in the day. The challenges themselves are a mix of old and new with the speed test, skittles, Pi Noon, line following and obstacle course making a return. With the new challenges of Minimal Maze and Slightly Deranged Golf joining them. For the first set I can draw on my experiences from previous events to know what approaches worked and what didn't, hopefully leaving most of the time to concentrate on the new events and actually having an interesting looking robot this time around (instead of a box on wheels that OptimusPi turned out to be). Of course the other question is what to wear! So far I've turned up as a pirate and then a scientist... I already have a few ideas, but I'll need some good time management to pull everything off. In theory I have just over six months to get everything sorted, but its surprising how fast that time can go.Plus there's also the blogging challenge, so stay tuned here for more updates!